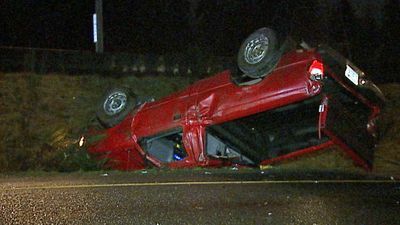 The Washington State Patrol (WSP) says a Snohomish County man was killed after a single vehicle accident on Interstate 5 near Lynnwood in the early hours of Thursday morning. Police say 42-year-old Vernon Strand, a 42-year-old man from Marysville, was driving southbound on I-5 just after 2 a.m. Thursday when his vehicle exited the roadway. He was driving a 2002 pickup truck near the Interstate 405 interchange and he drifted onto the grass shoulder, which caused him to lose control of the vehicle. The vehicle then crashed into a state Department of Transportation (DOT) sign and slid down an embankment on the grass shoulder, which caused the driver to be partially ejected from his vehicle. Strand reportedly died at the scene before any emergency crews could arrive to give him medical attention. Part of the freeway was temporarily shut down while police investigated the scene and medics attempted to provide Strand with medical care. Police are unaware if speed or alcohol or drugs were contributing factors to the accident. Because it occurred so early in the morning, it is likely that there were few witnesses to the Lynnwood crash.